The Asian Monsoon System is one of the Earth's largest and most energetic weather systems, and monsoon rainfall is critical to feeding over a billion people in Asia. 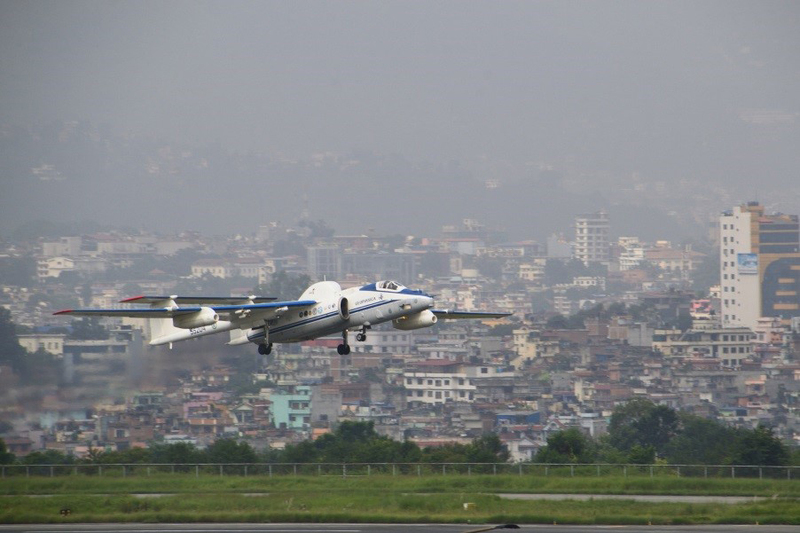 An international team of scientists led by the Alfred Wegener Institute, Helmholtz Centre for Polar and Marine Research (AWI), is now conducting the first-ever scientific mission to the upper levels of the monsoon system, using a high-altitude research aircraft flying out of Nepal. The results will help to better understand how this important weather phenomenon affects global climate and how it may change in the future. Scientists from the Max Planck Institute for Chemistry (MPI for Chemistry) and from the Institute for Atmospheric Physics at the Johannes Gutenberg University Mainz (JGU) are large part of the team. For the implementation on board of the high altitude aircraft they developed nine instruments measuring physical and chemical characteristics of dust particles and clouds. During summer, the Asian Monsoon is not only important for Asia but affects weather patterns over the entire northern hemisphere. The Monsoon also acts like an enormous elevator, pumping vast amounts of air and pollutants from the surface up to levels above 16 kilometers altitude. These altitudes are so high that monsoon air then ascends freely into the stratosphere, the stable layer that overlies the lower part of the atmosphere and contains the Earth's protective ozone layer. Once in the stratosphere, monsoon air spreads globally and persists for years. Satellite images show a large cloud of aerosols – small droplets or dust particles – directly above the monsoon and extending from the Arabian Peninsula to the eastern coast of China. The formation and properties of the aerosol cloud that sits above the monsoon are a major unknown in climate science, and their potential future changes represent one of the largest uncertainties in climate predictions. Aerosols may either warm or cool the Earth's surface, depending on their composition and how they interact with cloud formation processes. We also do not understand how monsoon rainfall will respond to changes in emissions of pollutants or to climate change. An international team of scientists led by the Alfred Wegener Institute is now setting out to close this gap of knowledge. The StratoClim project involves teams from 37 research institutions from 11 European countries, the United States, Bangladesh, India, and Nepal, and marks an important milestone in international research cooperation in the region. Project leader Markus Rex from AWI explains: "For the first time we will be able to study the composition of the air that reaches the tropopause region and the stratosphere above the monsoon and affects their composition globally." The StratoClim observations will provide the first close-up view of the upper reaches of the monsoon, as no prior research flights have ever sampled this critical part of the Earth's atmosphere. ERICA, a worldwide unique aerosol particle mass spectrometer was designed and constructed in Mainz specifically for these research flights aboard the M-55 Geophysika. The instrument vaporizes aerosol particles either by laser ablation or flash vaporization, this way converting the particulate matter into gaseous material. The gases are converted into electrically charged ions which are analyzed by means of a mass spectrometer. The method delivers direct reading on-line information on the chemical composition of individual dust particles. The development of ERICA (ERc Instrument for the Chemical composition of Aerosols) was financed by the EU through an ERC Advanced Grant for Professor Stephan Borrmann, who is both a professor at the Institute for Atmospheric Physics of the JGU and director at the MPI for Chemistry. He also leads the team of 14 scientists from Mainz in the StratoClim campaign. In addition to the online instrumentation, dust particles are captured and collected at altitude on special sample carriers for analysis in the laboratory. Four other instruments on board the aircraft measure the physical properties of droplets and ice crystals in high monsoon and cirrus clouds. Three instruments are used to detect fine dust and ultrafine dust, i.e. the smallest atmospheric particles. "At altitude these flights reach temperatures as low as minus 90 degrees Celsius and air pressures of one-twentieth of the ground pressure. This explains why only a pilot protected by a pressure suit is on board the aircraft and why all instruments need to operate autonomously and are fully automated," says Borrmann. Such extreme conditions imply enormous challenges for the experiments. "Considering the thousand possibilities for things to go wrong when dealing with such high tech instrumentation under such harsh conditions, it's a small miracle that our instruments functioned without problems already during the first flight," emphasizes the atmospheric physicist, Professor Stephan Borrmann. Experience might also play a role here, he adds, as his Mainz research group has been performing experiments on board of the M55 Geophysika for 21 years. The Mainz group is contributing 9 of the 25 instruments to the entire payload of Geophysika for StratoClim. Fred Stroh from the Research Center Jülich, the leader of the StratoClim aircraft campaign group, reports: "The Russian M55-Geophysika research aircraft took off from Kathmandu (Nepal) on the 20th July to carry out its first scientific mission in the air spaces of Nepal, India and Bangladesh, carrying 25 specially developed scientific instruments to altitudes above 20 kilometers – about twice as high as normal aircraft can fly." This flight marks the start of a series of nine research flights in this region extending to mid-August 2017. High-altitude airplane flights will be complemented by launches of research balloons from ground stations in Nepal, Bangladesh, China, India and Palau. Markus Rex summarizes the global importance of the research: "To understand how the monsoon will respond to human emissions of pollutants and to climate change is obviously of crucial importance for the countries directly affected by it. But it matters to all of us as well. Because the monsoon drives weather patterns around the world and affects the stratosphere globally, this research will also improve our understanding of climate processes worldwide and will improve climate predictions where we live." The research project StratoClim (Stratospheric and upper tropospheric processes for better climate predictions) is funded by the European Union. Its goal is to better understand key climate processes in the upper troposphere and in the stratosphere to enable more reliable climate predictions. More than 30 research institutions and universities from 15 mostly European countries coordinated by the Alfred Wegener Institute, Helmholtz Centre for Polar and Marine Research are contributing to the project.